After my kayaking adventure was over, it was time to get back on the boat. 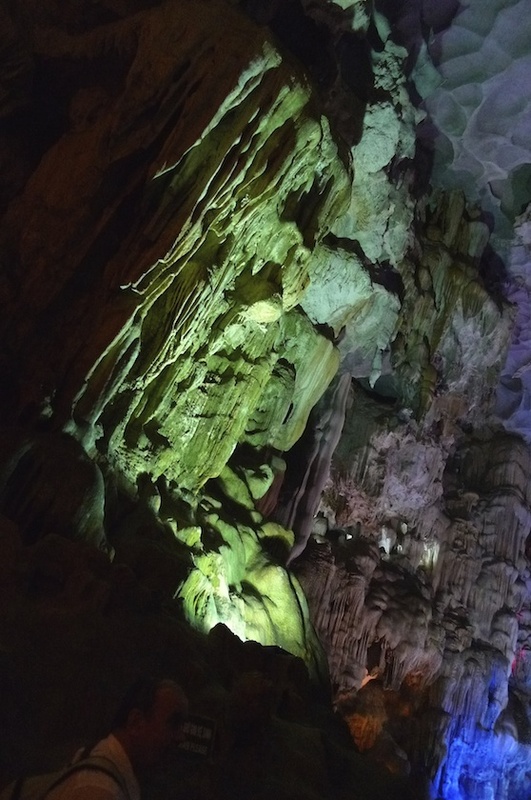 Our tour guide told us that we would be heading towards Thien Cung Grotto. At one point during our journey on the cruise, the weather became very misty. I thought it would stay like that, but the mist soon cleared up. Apart from enjoying the beautiful scenery, this relaxing boat ride offered countless photo-taking opportunities. Soon, our boat reached Dao Go Island where Dong Thien Cung or Thien Cung Grotto is located. There were many boats at the dock area. From the dock area, we needed to walk some distance to reach the cave. We reached an area with a number of informative signboards. A huge signboard with the words "Dong Thien Cung" welcomed us. 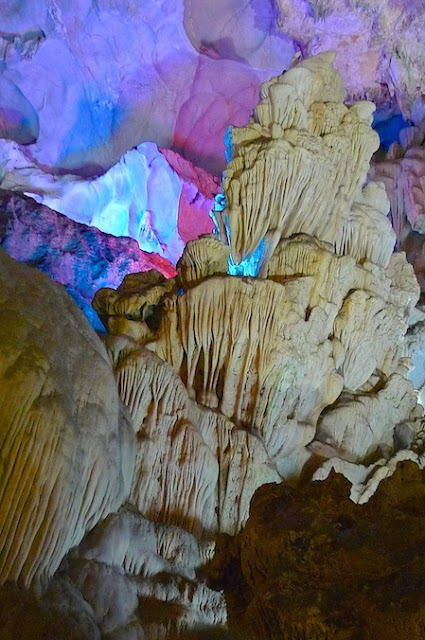 Also known as Heavenly Cave, Dong Thien Cung is a famous tourist destination in Halong Bay. To reach the cave entrance, we needed to climb up the stairs. Yes, the entrance of the cave is located somewhere in the middle of a hill. It was not difficult to walk up these stairs, but if you have a problem with climbing stairs, you may find it quite troublesome. Once inside the cave, we could see many colored artificial lights shining on the various shapes and structures of the stalactites and stalagmites. Our tour guide was helpful in pointing out some of the shapes that resemble dragons, animals and even human's private parts! I was not actually interested in what our tour guide had to say, so I did not really bother to identify the shapes and take pictures of them. The cave was beautiful, but that's because of the effect of the coloured lightings. I was not particularly impressed as I have seen nicer and more beautiful caves. The floor of the cave was a little slippery so just be careful when you visit this cave and remember to wear a good pair of shoes. Coming out of the cave was quite a relief for me. To be honest, the panoramic view of Halong Bay that greeted us on our way out was way more exciting than the cave itself! LOL! Love the scenery from up here! That's our boat below - with the blue signboard - waiting for us! We had spent about an hour visiting Thien Cung Grotto. It was time to leave. Back on the boat, it was another hour of leisure ride before we reached the wharf, which marked the end of our Halong Bay trip. After that we got back on our tour bus and began the 4 hour journey back (with the customary stop at a souvenir shop as expected) to Hanoi. I had enjoyed my one-day Halong Bay cruise. I did not think it is necessary to stay in Halong Bay overnight or even for a few nights, but some people may disagree with me on this. It all depends on what you like to do. If you like to go kayaking, swimming and visiting lots of caves, then staying in Halong Bay for two or three days may be worth your while. Otherwise, stick to the one-day tour of Halong Bay and you won't regret it.